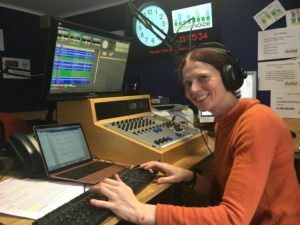 I did my first Booktime Brunch show on Chiltern Radio yesterday. This morning I listened back to it and oh my dears. The skin-crawling horror of hearing your own recorded voice. Your lack of technical know-how writ large in dead air. Your beautifully-laid plans, wrecked by an unpressed button. The show goes out live, so there is no going back from the mistakes. Let the first edition of Booktime Brunch with Antonia Honeywell stand as a Terrible Example to any writer thinking of venturing outside the house. I had my opening carefully planned. A heartfelt welcome and introduction to the show, then, ‘There are no prizes,’ I said, almost fluently, ‘for guessing the classic novel that inspired this first track – but how could we start a book show with anything else?’ At that moment, instead of the tinkling and unmistakeable introduction to Kate Bush’s Wuthering Heights, the system started playing LeAnn Rimes’ Can’t Fight the Moonlight. Which is, it turns out, a fine pop song. I’m glad I’ve heard it, but I’m not convinced it was inspired by a classic novel, or that LeAnn Rimes suffered from TB and died before seeing her great work succeed in the world. She’s releasing her first Hallmark movie, It’s Christmas, Eve, on November 10th this year, so it seems unlikely. Good luck, LeAnn! Love your work! Listeners were probably also a little surprised to be asked to spot the reference to ‘a work of complete and utter genius’ in The Bee Gees’ How Deep is Your Love? I was surprised too, having intended to play The Police’s Don’t Stand So Close to Me followed by Lana Del Rey’s Off to the Races (that book by Nabokov, see?). I compensated for having had the microphone off at the wrong time by turning it on at an equally wrong time, which resulted in a pitched battle between me and Barry Gibb (he won). I think the highlight was telling the world that Mary Shelley’s Frankenstein was inspired by T’Pau’s China in your Hands. It’s true that it’s a great song, and the spoken line, ‘What have I done? Why is it not working?’ clearly audible in the introduction, only enhances it. I like to think Mary Shelley would have been inspired by 1980’s pop ballads if she’d been born a few hundred years later and had ever actually heard any. Also in the category of lost opportunities, I must place the truly beautiful lecture on John Donne I gave in the run-up to Simon and Garfunkel’s I Am A Rock, lost to posterity because, once again, I hadn’t turned up my microphone. Worst of all, nerves and dead air phobia tricked me into calling Martin Amis ‘one of our greatest modern novelists,’ when actually I’d far rather have a pitched battle with Martin Amis than with Barry Gibb. Still, on the plus side, his London Fields did inspire Blur’s Parklife. The rest I can forgive myself for. But there were glimmers of hope. Turns out that books and music are a great match. And I survived, and so did the studio, and so did the long-suffering and generous Paul Dancer, who stayed with me in the studio and showed me what to do, and let me make mistakes whilst keeping my self-esteem intact. Thank you, Paul. Not so much a car crash as a first draft. I played out with James’ Sit Down, which lead singer Tim Booth wrote after discovering Doris Lessing’s writing during a period of depression. He realised he wasn’t alone. None of us are. Next week’s show is for all those of us who are struggling with our dreams right now. Come and sit down next to me next Monday, 10-12. Booktime Brunch with Antonia Honeywell is live on Chiltern Radio, 10-12 on Mondays. Listen online, from anywhere.